Like many of you I’ve bought it because of its weight. Having an akto there is certainly a weight gain, but also a big frustration gain. Every time I pitch it I wonder what is wrong. Even on a straight grass field the fly isn’t straight. There’s no ventilation at all, which is warm when it’s cold but also results in a lot of condensation in the morning. 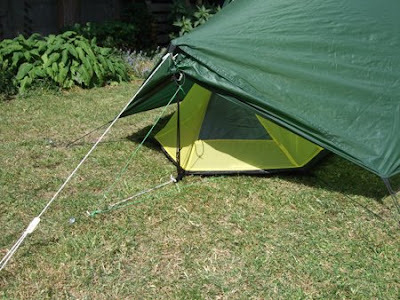 Every tent has more or less condensationproblems but with the Akto it’s easy to take the inner out and keep it dry. This I do often when it’s raining and I have to break up camp. The dry inner in the backpack, the wet fly rolled up on the outside of my pack. Because the inner and outer are attached by the small poles it’s difficult to detach these with the Laser Comp. Mostly ending up with a wet back and a wet innertent. 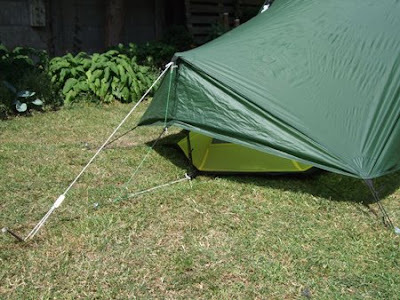 Then there is the polehood…..the tension on the doorzipper, the inner and fly guylines etc. There are exellent Terra Nova Modifications. See also the blog of blogpackinglight. http://blogpackinglight.wordpress.com/laser-comp-mods/ But the venting option can be improved. Of all the problems I’ve started and fixed the ventilation. And even better than an Akto. 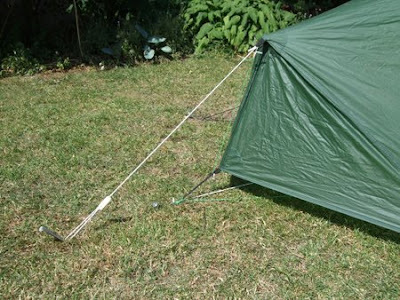 I can now fully adjust the ventilation while in my sleeping bag it on both sides with just some guyline and a stake. It's basicly the same as on the normal laser. You will be able to a lot more ventilation than many other seen solutions. Here the setup when closed. It could be wise to use an extra peg because the tension aplied can be big due to the use of the shock cord. When the peg fails it does not endanger the integrity of the outer fly. 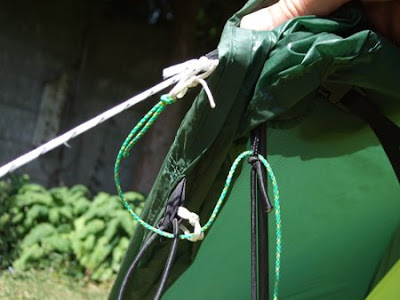 The cord to open runs from the attachementpoint through the shockcord and on the inside backup again through the loop where the shock cord from the pole is attached. From there you can run it through a loop down at the pole or straight to a pag in the ground. The latter gives less friction and is what I use. This is attached on to the shock cord and runs through a loop. This is made from a small piece of rope. And attached to the pegloop of the guyrope that runs to the bottompole attachement. A detail of the rope that opens the fly. 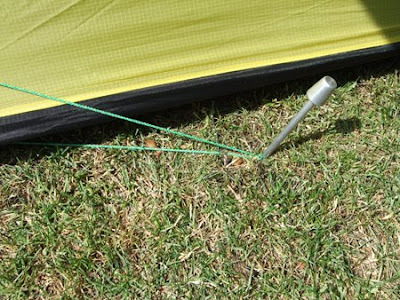 A simple peg secures one of the rope. The use of different colors and different thickness is advised. So even when light is bad you can find the right rope. 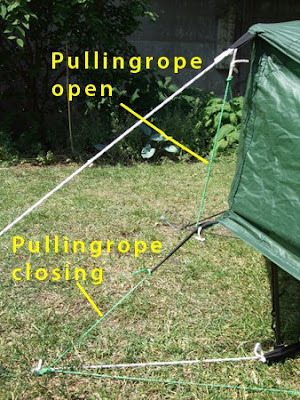 Making loops in the rope can help to fix the line to Open, Halfway and Cosed. Better than a peg, a problem when using a goundsheet with front cover, would be to create a line on which the pulling ropes grap with a prussikknot. What would be the best way to do this i still have to figure that out.